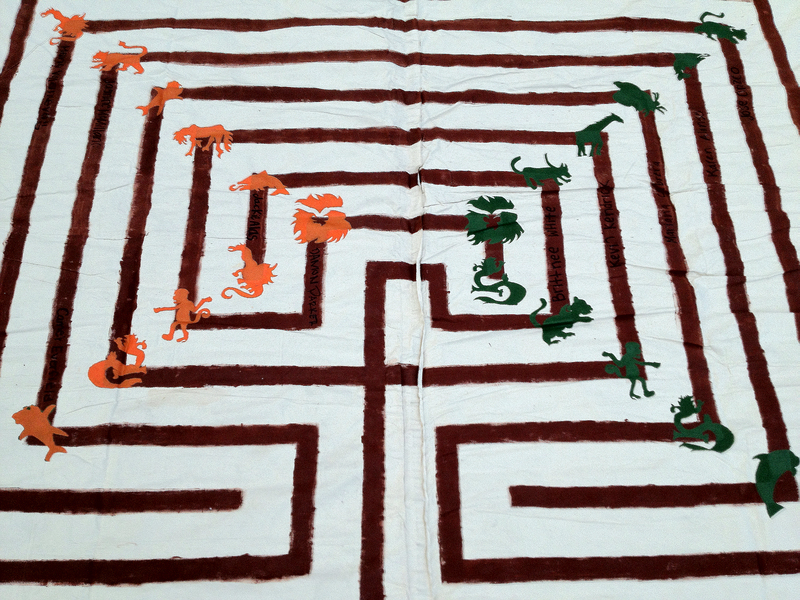 12’ x12’ canvas labyrinth with stencil prints of “avatars” (requested by the teacher due to student interest), by 10th grader at New Designs Charter High School. Participants also created “artist books” about their power avatars, including journal reflections. A public exhibition for families was mounted during the senior graduation event, at the Baha’i Center of Los Angeles, CA, in June 2010. 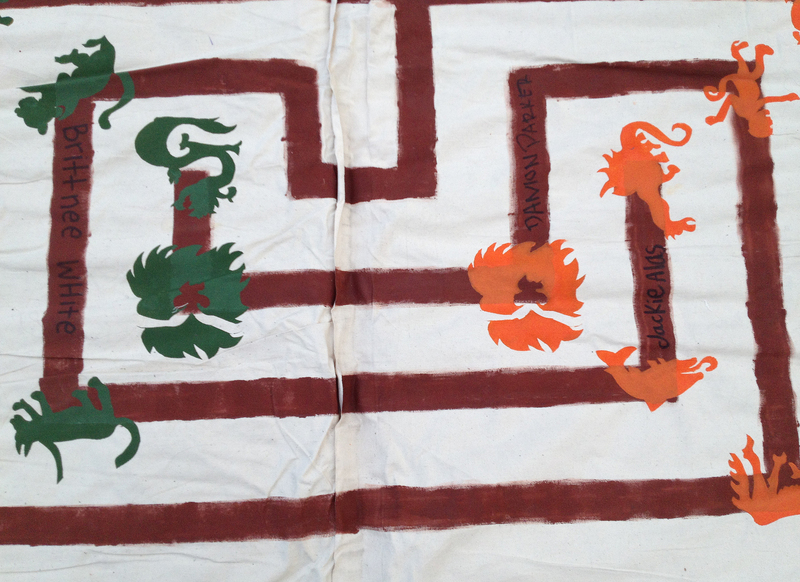 In this interdisciplinary course, students were introduced to strategies useful in solving personal issues and techniques for mediating conflict; assignments that offered resolutions to challenges in their personal lives; and art skills to create peace and conflict symbols, concluding with stencil prints on a human-scaled canvas labyrinth, one kind of mediation environment, with the intention of finding a dedicated site on the school campus. Experiential, team-building exercises demonstrated the importance of a vibrant engaging peace, and productive conflict, which is key to the growth and evolution of human beings. How do ideas like empathy, respect, tranquility or pro-active peace get transformed into visual images that reflect productive win-win solutions for all involved? The art lessons, and the companion lessons in dispute resolution, highlighted constructive resolutions and community building. -exercise: what has influenced who students are today and how can they consciously choose productive directions for their lives? -win/lose and win/win role playing and introduction to mediation strategies in their own lives. -stencil prints on a canvas “labyrinth,” one kind of mediation environment. -constructive critique strategies to empower one another. *Conflict Resolution Lessons adapted from: Lieber, Lantieri, and Roderick, Conflict Resolution in the High School, publisher Educators for Social Responsibility, Cambridge, MA, c1998; and Aldridge, Giggans, Friedman, In Touch with Teens: A Relationship Violence Prevention Curriculum for Youth Ages 12-19, publisher Peace Over Violence, Los Angeles, CA, c2008.